This comprehensive volume brings together international experts involved in applying and developing understanding of Working Memory in the context of a variety of neurodevelopmental disorders, neurocognitive disorders, and depressive disorders. Each chapter provides a description of the disorder and investigates the Working Memory and related Executive Function deficits. It goes on to provide a neurological profile, before exploring the impact of the disorder in daily functions, the current debates related to this disorder, and the potential effects of medication and intervention. Through combining coverage of theoretical understanding, methods of assessment, and different evidence-based intervention programs, the book supports clinical assessment and management of poor Working Memory. 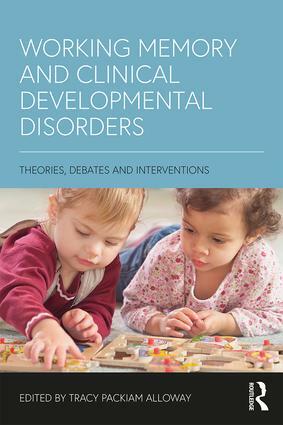 It is essential reading for students in neurodevelopmental disorders, atypical development and developmental psychopathology as well as allied health professionals, clinicians and those working with children in education and healthcare settings. Tracy Packiam Alloway is Professor of Psychology at University of North Florida. She has spent over a decade being part of cutting-edge research on the importance of Working Memory in education and has published over 100 research articles and book chapters. Her research has appeared in over 250 news articles, and she has been invited to comment on television and radio as an expert on Working Memory.